The Green Fiji Acropora is a more difficult Acropora to find, yet a treasure to own! 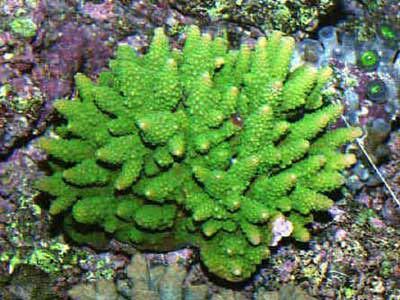 The Green Fiji Acropora is also known as the Bushy Acropora. A. bushyensis gets its name from the "bushy" looking polyps that project from the corallites. They grow in an interesting "ball" like formation with digitate projections emanating from the center. The aqua cultured specimens have the more intense greens and yellows, as opposed to the wild specimens which are creams to light browns. For instance, the coral above, called the Green Fiji, is a green bushy coral (as evidenced by its color and the name A. bushyensis). Definitely a unique looking Acropora to add to your collection if you can find them. The A. bushyensis have been propagated in captivity thus helping to spare wild populations in the world's reefs. Buying captive propagated A. bushyensis helps the aquarist, since they are a little more hardy than their wild siblings, but they can still succumb to diseases typical to Acros. Distribution / Background Acropora Coral Information: The Green Fiji Acropora Acropora bushyensis was described by Veron and Wallace in 1984. They are in what is called the lovelli group of Acroporas that also include A. verweyi, A lovelli, and A. glauca. They all have similar responses to growth patterns from the water movement around them. They are in a finger growth pattern called digitate, which refers to the fingerlike projections from their central base. Some of their growth forms have been included in common names such as Bushy Acropora, Finger Acropora, or Green Bushy Acropora. Where Acropora Corals Are Found: A. bushyensis inhabit only the southern areas of Australia's Great Barrier Reef to the east, as well as Papua New Guinea. Acropora Coral Habitat: The A. bushyensis are almost always found in reef lagoons In the wild. Status The Acropora bushyensis is on the IUCN Red List for Endangered Species as Least Concern (LC). Description What do Acropora Corals look like: All Acropora Spp. corals have very porous and lightweight skeletons. The A. bushyensis have a finger growth pattern called digitate, which refers to the fingerlike projections from their central base. The cylindrical and slightly tapering branches radiate from the middle of the colony. They have corallites that face outward as opposed to upward, giving it a unique appearance. Acropora bushyensis colors can be cream or pale brown with blue tips, and some aqua cultured colors of yellow to green are also available. Acropora Coral Life Cycles: The Green Fiji Acropora or Bushy Acropora A. bushyensis reaches sexual maturity within 3 to 5 years. Like many other Acroporas, they may grow up to 20 inches (51 cm). They can live 4 to 7 years. Acropora need to be carefully acclimated to their new homes. They need to be placed in their permanent position within a tank after acclimation. It takes about 5 to 6 months for the A. bushyensis to regain their normal growth rates after being added to an aquarium. Moving Acropora from place to place will stress them, and possibly cause death. A typical live rock/reef environment is what is needed for your Green Fiji Acropora, along with some fish for organic matter production. A mature tank (well over a year old) is advised to increase the chance of successfully keeping Acropora. Availability Acropora Corals for Sale: The Green Fiji Acropora A. bushyensis are difficult to find online and at pet stores. Online they can run about $30.00 USD or more depending on size and color.